If you're a member of the illustrious Followill clan - brother, cousin, great aunt - chances are you'll be involved with Kings Of Leon to some degree. Next to the band themselves, perhaps the best-known member of the family is guitar tech Christopher 'Nacho' Followill, an easy-going, laid-back sort who also happens to be a dead ringer for Malcolm Young circa 1980. 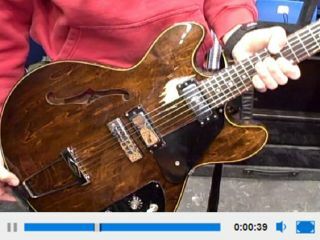 During sound check in Pittsburgh, Pennsylvania, Nacho took MusicRadar on a private tour of Caleb and Matthew's guitar rigs and axe arsenals (including Caleb's prized Gibson 325, a stunning workhorse instrument that bears the unmistakable marks of the singer-guitarist's ferocious, percussive style of strumming). Oh, and you might be asking yourself, "How did he get the nickname 'Nacho'?" Watch the video to find out.